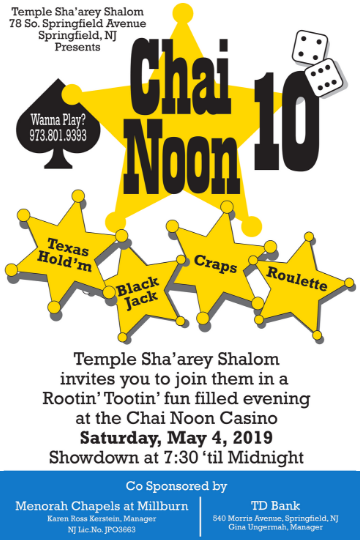 Join us for our tenth casino night, “Chai Noon,” on Saturday, May 4, from 7:30 till midnight at the temple. Players will be able to try their hands at Texas Hold’m, Blackjack, Craps, and Roulette. Tickets must be purchased in advance and range in price from $36 to $250, depending on how many chips are included. Snacks will be provided during the evening. For tickets or more information, call Dotti at (973) 801-9393. Players must be at least 21. All of the dealers will be professionals. The evening is sponsored by Menorah Chapels at Millburn and TD Bank.